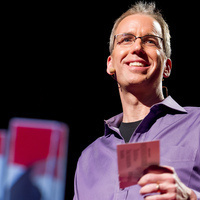 Frank Warren demonstrates the power of sharing your hopes, dreams, fears and failures and how PostSecret became the catalyst for his passionate commitment to mental health advocacy. What started as a community mail art project in which people anonymously share never-before-voiced secrets has since captured our collective imagination and evolved into a worldwide phenomenon. Several New York Times best-selling books, national art exhibits and an album and theatrical production later, Frank’s PostSecret website has become the most visited ad-free blog in the world, honored with multiple Webbys for “Best Blog on the Internet.” PostSecret has also raised over $1,000,000 for suicide prevention and earned Frank a Mental Health Advocacy Lifetime Achievement Award. In Frank’s interactive multimedia event, PostSecret Live, he engages audiences with the inspiring, funny and at times heartbreaking stories behind the secrets. As he delves into how the project led to his ardent involvement in suicide awareness, Frank demonstrates that by sharing our personal struggles, we can help each other and release our burdens. Live changing evening.... It was a intimate time of laughter and humanity. I thought the subject matter was very relevant to college students and the struggles of withholding secrets, whether from recent or longstanding hurts. The presenter shared various ways in which students can find support and relief. Great speaker.